What can you do with the task form and resource form? The task form and resource form are nice views if you want to have some more detailed information per task/resource. The task form will provide an overview of tasks including task information per resource. 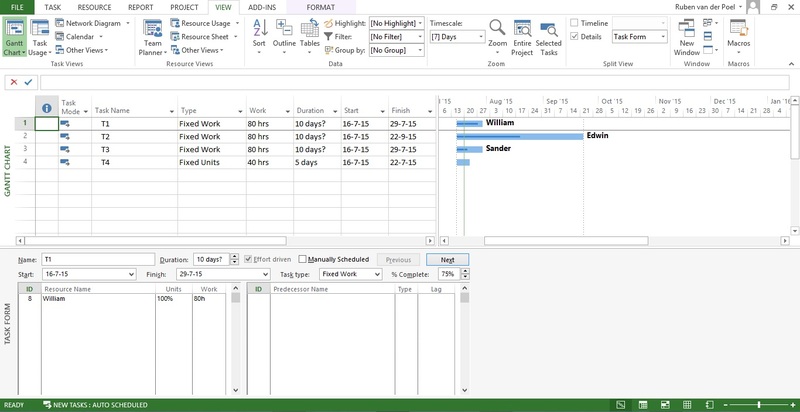 The task and resource form can be added to the Gantt chart (or any other view) by clicking view tab, checking Details and selecting either the task or resource form. The resource form will show which other assignments these resources already have. See the other resource, by clicking Next (for tasks that have multiple assignments). Note that both the task form as the resource form have different views, which you can select by right-mouse-click anywhere in the view. Any of these views provide much more detailed information on a task or a resource, as for instance cost information or dependencies. ← What is a cost breakdown structure? → What is resource leveling in MS Project and should you use it?